Perfect for watching television in a smaller living space, this entertainment console would be a nice addition to your living room. With a traditional flair, the bracket feet accentuate the sophisticated appeal of this piece. 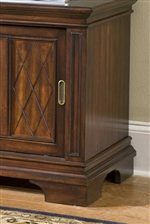 Constructed out of poplar solids and birch veneers with engineered wood in a hand-rubbed windsor cherry finish, the inviting style of this TV cabinet will fit in any décor. This credenza can hold up to a 47 inch television and features two sliding door cabinets, each with an adjustable shelf. The surfaces include a clear coat finish to guard against wear and tear stemming from normal use. Watch your favorite television shows and movies using this functional entertainment console. The Windsor HS Entertainment Console by Home Styles at AHFA in the area. Product availability may vary. Contact us for the most current availability on this product. Utilize one of these functional and traditionally refined entertainment consoles in your living room. Perfect for smaller living spaces, these TV cabinets provide the ultimate functionality for entertaining. Made out of poplar solids and birch veneers, bathed in a rich windsor cherry finish, and stylized with classic bracket feet, these inviting pieces will look great in your home. Make movie night convenient with one of these wonderful entertainment consoles. The Windsor HS collection is a great option if you are looking for Traditional furniture in the area. Browse other items in the Windsor HS collection from AHFA in the area.